CO-PRO is a quick and effective way to detect the presence of Carbon Monoxide (CO) in breathing air. If the air is contaminated by CO, the Capsule within the balloon will change color. Q: How many times can I use the CO-Pro? A: It can be used multiple times or until carbon monoxide is detected. Once the package is opened, the CO-Pro should not be exposed to atmospheric conditions longer than eight hours. Poor atmospheric conditions (carbon monoxide, moisture, etc..) can greatly decrease the sensor's ability to detect. Q: At what ppm does the CO-Pro start to indicate? A: The CO-Pro can indicate carbon monoxide as low as 5ppm. Q: How long does it take for the CO-Pro to indicate carbon monoxide? A: It all depends on the concentration level. The higher the concentration, the faster it will indicate. Q: What is the shelf life of the CO-Pro? A: Each package has an expiration date stamped on it. Approximately 2 years. "Our goal in creating this important message is to remind divers and boaters that they share access to the same waters and thus need to adhere to safety precautions that will ensure an enjoyable experience for all," commented Tom Ingram, Executive Director of DEMA. "By increasing the awareness of the divers-down flag we hope to keep diving safe for everyone this summer." The primary mission of the Ontario Underwater Council is to promote safety to the dive community. The OUC has implemented several initiatives to do this. This project is to promote Boater Awareness of the two dive flags and what boaters should do when they see these flags. On January 13, 2007, OUC kicked off its first initiative with the delivery of a Boater/Dive Flag Awareness flyer to four booths at the Toronto International Boat Show, in an effort to raise awareness of the dive flags within the boating communities. Our message was embraced wholeheartedly and the offers to assist were quite encouraging. A number of people we talked to were also scuba divers and were very appreciative of the message being delivered. 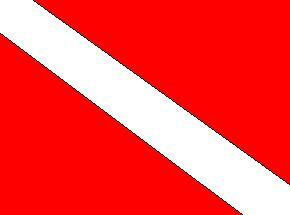 Here are several videos on YouTube which also relate to dive flag awareness. This first video is from Florida. This second video is from Hawaii. This initiative is to provide a report on SCUBA incidents within 72 hours of an incident being reported to the OUC. To see these reports please use this link: 72 hr Ontario Scuba Incident Reports. Diver access to this program is negotiated by the OUC. This initiative is to reduce the number of fatalities which occur at Fathom Five National Underwater Marine Park. The program involves updated registration forms, shipwreck information and classification and other information. You can review the OUC Documents on the SDSAP program here: Powerpoint Presentation - Fathom Five. This initiative is to inspect and report on the condition of vessels planned to be scuttled in Ontario waters. Under the authority of the Ontario Government, the OUC is the body sanctioned to perform this service. The report provides recommendations to the parties within the following guidelines. 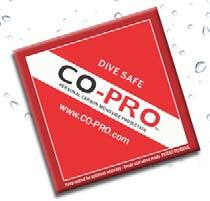 The OUC also publishes links to other organizations which have safety related information available for divers. The WRSTC sets the minimum standards for Recreational Scuba Diving / Training. DAN provides useful information on many aspects of diving as well as providing insurance to divers. You can get more information on DAN online seminars, publications, insurance and courses below. 1-919-684-9111 - Note ! NEW PHONE NUMBER ! Whenever you need help, DAN is here. DAN's medical staff is on call 24 hours a day, 365 days a year, to handle diving emergencies such as decompression sickness, arterial gas embolism, pulmonary barotrauma or other serious diving-related injuries. Divers Alert Network (DAN), a non-profit organization, exists to provide expert information and advice for the benefit of the diving public. DAN's historical and primary function is to provide emergency medical advice and assistance for underwater diving injuries, to work to prevent injuries and to promote diving safety. Second, DAN promotes and supports underwater diving research and education particularly as it relates to the improvement of diving safety, medical treatment and first aid. Third, DAN strives to provide the most accurate, up-to-date and unbiased information on issues of common concern to the diving public, primarily, but not exclusively, for diving safety. Planning to take a full SCUBA course or a introductory Scuba course? An introductory SCUBA course is a great way to find out if this is a sport for you. Most clubs, stores and resorts can offer you an introduction to SCUBA. Please ensure that any SCUBA course is affiliated with a recognized agency. Planning to take an online scuba course? Please ensure that any online SCUBA course is affiliated with a recognized agency. Click here to read the WRSTC’s stand on online courses. Download a copy in English here. Téléchargez une copie en français ici. Please contact the Safety Director at ouc.safety<"@">underwatercouncil.com for any questions or concerns about the content of this page.